High Ropes Course for your Birthday Party! Wanting to be a bit more adventurous on your birthday and try a completely new experience? A High Ropes Course birthday party might be perfect to help you celebrate. High Ropes Course has been growing in popularity as a birthday party activity recently, with its full tree top courses full of exciting challenges, zip wires and climbing races for your whole birthday group to enjoy. 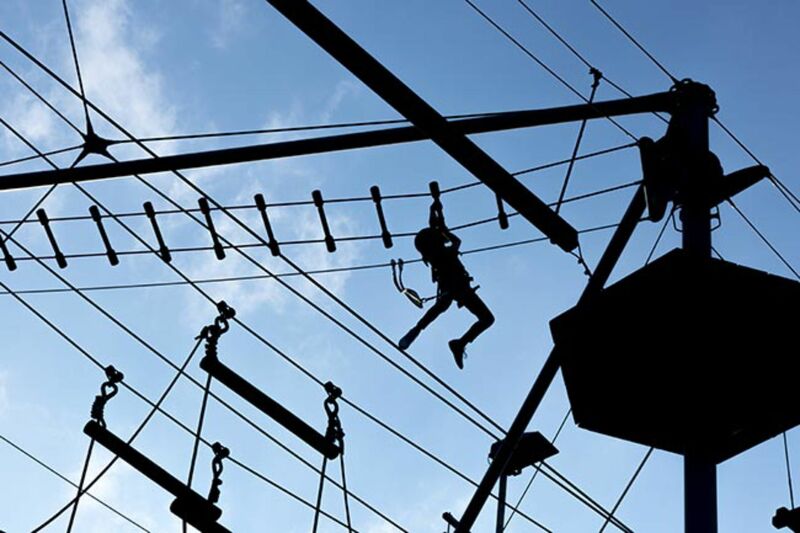 High Ropes Course is ideal for a group of all mixed ages, abilities and interests. Whether you’re a thrill seeker, or just want to try something new at your own pace High Ropes Course is great fun for all. All of the courses vary depending on your chosen location, but all last around 2-3 hours of jumping, climbing and having some laughs with friends and family. If you’re worried about the safety aspect of a High Ropes Course, there’s no need to as High Ropes Course is renowned for its safety briefings and high quality safety equipment, as well as a couple of practice sessions to get you ready for the course so all you need to worry about is having a great time and trying a new experience! A High Ropes Course birthday party activity is made solely so that everyone can get involved and have a fantastic time, as all the activities and courses are built for friends and family so you can all have some laughs and enjoy the experience together. If your dream birthday party is to go on an adrenaline pumping adventure with as many people you choose, then the High Ropes Course birthday party activity sounds right up your street. If you want your High Ropes Course birthday party adventure fully organised and stress free, call us on 0161 341 0052 and let our events planners do the hard bit so you can thoroughly enjoy your birthday party activity!